There was a long list of programs, but this one gave me the giggles: Good Guys Reception, sponsored by the National Rifle Association and Freedom Alliance. By invitation only. So since this is a big weekend for the Republicans, I thought I would take a look back on the blogging I've done about CPAC since 2009. 2009: Crazy With Fear: CPAC 2009. My first trip down the rabbit hole. What an adventure! 2010: Square Deal, New Deal, Fair Deal, Raw Deal . Alas, but a mere mention. I don't know what was going on that year but CPAC obviously wasn't a priority. 2011: Friday Follies: Mother Jones, Feral Pigs, Palin, Bachmann, Simpson and Da Yoopers. An even tinier mention, having to do with Michelle Bachmann, but the rest of the blog is pretty good. 2012: Thank You, Cal Thomas. Mighty Big of You. I wrote back then that Cal Thomas could probably kick himself for getting involved with that bunch. Silly me. He's on the roster again this year. 2013: CPAC 2013. Wingers Just Want to Have Fun. But not too much fun. The dress code--an entire poster full of dress code--says no-no to the nightclub look and to Walmart wear. Conference-goers are required to look like they mean business, even if there's funny business going on. But they did allow zombie costumes at "The Walking Dead, Obama Zombies on Parade" bash. So that's cool. 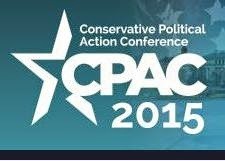 2014: Hail, CPAC! Silly Season is Upon us. Can Spring be Far Behind? Wherein Ted Cruz puts on his McCarthy face and Christine (I am not a witch) O'Donnell does a book signing along with Callista Gingrich, one of Newt's wives. Good times. So that's it, then. I'll probably be following along on Twitter and Facebook when I think of it, looking for the fun stuff. I just hope there is some fun stuff. I don't know. The Republicans have been letting me down in the fun department lately. Ever since they took over the entire federal government, except for that one place where that foreign squatter with the funny name lives. I hate it when they do things that don't make me laugh. Power does tend to make the freaks less freaky. It seems to me all the talk after the 2012 election about moderating the party worked the way they wanted it to: they are now in better control of their messaging. They never intended to move an inch on policy. And why should they? They won big in 2010 and 2014. And if the economy tanks in 2016, they will have the White House. I was looking at some economic growth data for the last six presidents that Dean Baker presented. He was showing that Republican economic policy actually led to lower economic growth (to say nothing of increased inequality) than it did under the Democrats. But I noticed something interesting: of the last six presidents, three were Republicans. What's more, those six presidencies represent 10 terms, with the two parties each getting five. So why change? And I'm afraid that's what the elites in both parties think. But you have a stronger stomach than I do. If anything interesting happens, let me know! I didn't watch much more of CPAC after I wrote this. Just kept up with the sound bites, which were pretty entertaining. It's no secret that we've done worse under the Republicans than we have under the Democrats. That's because the Democrats' ideas are more liberal and thus are more inclined to be inclusive and fair. Apparently, inclusive and fair doesn't sell these days. We would rather keep ourselves miserable than admit the liberals had it right all along. So I ask everyone except the very rich (because I know they won't understand the question): What is wrong with being inclusive and fair?